Not content with the takeover failed purchase of VW, Wiedeking (Porsche's ex-CEO) apparently wanted to branch out into the luxury hotel business too. 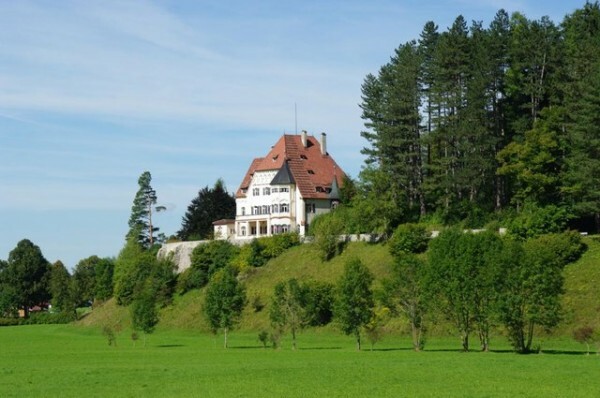 In 2006, Porsche purchased a small castle (size is relative when you're talking about castles) in the village of Hohenschwangau near Füssen in southwest Bavaria, Germany. Built in 1905 for a Munich entrepreneur it was sold in 1927 to a German prince who lived their with his family, until his death, in 1996. If you think this might make a nice country garage for your Porsche, buyer beware. Given the location of Porsche's castle (it's nestled between two of Bavaria's biggest and most famous: the royal castles of Neuschwanstein and Hohenschwangau) you'll not only need to work hard to "keep up with the Joneses", you'll need permission from the Bavarian State Parliment to do almost anything with it. The heirs of the castle's former owner, Prince Raphael von Thurn und Taxis, had plans approved to convert the castle into a luxury hotel, but were never able to get it off the ground. When Porsche purchased it for 6 million Euros in 2006, they planned on utilizing those plans themselves. When asked, Porsche didn't explain the reasons for the sale, only confirmed that they, "are parting company with this estate."